Joyce Lee (Bradley) Lewis, 93 of North Manchester, Indiana passed away Thursday, September 6 at Parkview Memorial Hospital in Ft. Wayne. Mrs. Lewis was born in Peoria, Indiana on February 11, 1925 to Joseph and Hazel (Long) Bradley. 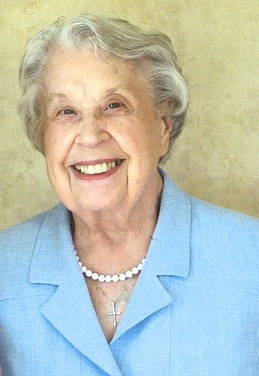 Mrs. Lewis attended Butler Elementary School in Peoria, IN, graduated in 1943 from Peru High School and attended Butler University where she became a member of the Tri Delta Sorority. On April 6, 1948 she married John Vincent Lewis at the St. Charles Catholic Church rectory in Peru. From 1948-1951 Mrs. Lewis was employed as the secretary for Peru Mayor Geoff Wolff. In 1965 Mrs. Lewis moved with her family to Champaign, Illinois. From 1974-1986 she was payroll manager for the Champaign Park District. While living in Champaign she was an active member of Faith United Methodist Church. Mrs. Lewis and her husband were the parents of three children: Dr. Jay (Kathy) Lewis, Peru, Jeffrey Lewis of Darmstadt, Germany and Jennifer Lewis-Neubauer of Champaign. Along with her parents Mrs. Lewis was preceded in death by her husband, John, brother James Bradley, sister Joanna Mayfield, grandson Andrew Jacob Lewis and great-granddaughter Virginia Anne Lewis. She is survived by her sons, daughter and daughter in law; grandchildren Matthew (Tracy)Lewis, Peru, Rachel (Andy) Richey of Logansport, Carrie (Witting) Lewis (wife of Andrew) Chagrin Falls, OH. Max McCarty of New Zealand and Jake McCarty of Vienna, Virginia. She is also survived by great grandchildren James and Grace Lewis of Peru, Owen, Colin and Aiden Richey of Logansport and Charlie and Cate Lewis of Chagrin Falls, OH. Services will be held on Tuesday, September 11, 2018 at 11:00 AM at St. Charles Catholic Church. with Rev. Dennis Lewis officiating. Burial will be at Mt. Hope Cemetery. Family and friends will gather Tuesday, September 11, 2018 from 9:00 AM till 10:45 AM at the Eikenberry-Eddy Funeral Home, 84 W. Main Street, Peru. Memorial contributions may be made through Eikenberry-Eddy Funeral Home, directed to Alex’s Lemonade Stand for Pediatric Cancer Research or Faith United Methodist Church in Champaign, IL.